Meteorites - one of the rarest and most sought after collectible items on Earth. WARNING! - SPECIAL NOTICE ! - WARNING! Like all expensive collectible items, buyers need to beware of unscrupulous firms & individuals selling Meteorite samples & sets.The old adage "you get what you pay for" certainly applies here. Because of rarity of authentic Meteorites, there are people selling bogus Meteorites on both internet auction sites as well as web sites. In some instances, the sellers do not even know they are selling bogus samples. To the untrained eye, many rocks may appear to be Meteorites, but certainly are not. 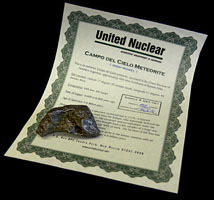 All our Meteorite samples include a certificate of authenticity, and are absolutely guaranteed to be genuine.